Thanks to NetGalley & HarlequinTeen for the e-Galley of this book. Sixteen years ago, the kingdom of Hytanica warred with their great enemy, the Empire of Cokyri. Suddenly ceasing all attacks, the Cokyri infiltrated Hytanican villages nightly and stole forty-nine infant boys. Within a week the bodies of the infants were found scattered before the gates of Hytanica, but only forty-eight corpses were accounted for. With that last horrifying act, Cokyri withdrew to their borders and ended the long conflict. Princess Alera of Hytanica has always known a life of ease, free from the terrors of war that proceeded her birth. Now a young lady of seventeen, her biggest concern is how to dodge the unsuitable suitor her father has chosen for her. Because the power of her family’s crown will never rest with a woman, Alera’s duty as the eldest princess is to marry a man who would be king. The suitor the king has chosen as his successor is charming, handsome, utterly narcissistic, yet capable. Alera cannot stand him. She wishes, rather, for the ideal situation – marriage for both love and duty. Forced by tradition to choose a husband before her eighteenth birthday and the king’s urgency to announce her engagement, Alera desperately begs her father for more time to find someone who might win her heart as well as her crown. She never expects to fall for the one man her father would never approve of. When Alera meets Narian, a Cokyri prisoner of the Hytanican guard, she finds herself both fascinated and a little frightened by him. Soon the two are meeting in secret, and as her birthday fast approaches Alera discovers much about the legacy of hate between their two countries, bits of Narian’s mysterious past, and the agony of first love. Will Alera choose her heart or her duty? And would choosing her heart mean the destruction of her beloved country? Approaching this review, I was so torn on my feelings for this book. One of the things I both loved and hated about Legacy was the sheer amount of detail that Kluver includes. On the one hand, the almost excessive descriptiveness makes this book so vivid and lovely to read. I had no problem imagining Alera’s settings and surroundings. In fact, Kluver is so thorough in her details that I could most likely draw up a floor plan of the Hytanican palace, and accurately decorate some of the rooms as well. However, the descriptiveness, while in many ways interesting and beneficial, prevents this book from maintaining any kind of steadily building, suspenseful pace. I wouldn’t call Legacy boring by any means, but it certainly isn’t a can’t-put-it-down, page-turner. This book is not for the feint of heart. 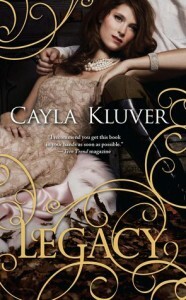 The characters of Legacy are quite well done, and Kluver’s attention to detail certainly wasn’t lost on me in regard to this. I love when characters come to life and she’s done a beautiful job of creating them in this book. The members of the royal guard were probably some of my favorites: from London, the bodyguard with authority issues; to Tadark, the petty, big-mouthed comic relief; to Destari, the even-keeled, quiet protector; to Cannan, the authoritative, intimidating Captain of the Guard. They were all so colorful and had such intriguing, real personalities that jumped right off the page. Our main character and narrator, Alera, was a practical, courageous, intelligent and passionate girl whose occasional tendency for impetuousness and rash action lent the story some interest. Narian, while I feel I know who he is, how he came to be that way is still something of a mystery and I’m eager to find out more about his past. On the other side of this love-triangle, is Steldor – the aforementioned unsuitable suitor. While Alera might not find anything appealing about him, I found him to be one of the most interesting characters in the book. His motives and feelings regarding Alera are hard to discern, but then every once in awhile, Kluver reveals flashes of what’s going on beneath the surface and he becomes a wonderfully dimensional character. Narian has won my heart, but I will admit that I’m looking forward to more Steldor in the sequel. The treatment of women in this book is an aspect that simultaneously piques my interest and boils my blood. In conjunction with that, the dichotomy between the Hytanican and Cokyrian views of gender roles was fascinating as well. This book centers around the fact that Alera must marry and soon. Though she is the eldest heir to the crown, she as a woman, is not eligible to rule on her own. Tradition and society dictate that a man must rule, and so she is to find a husband who will accept her and the responsibility of the crown. Women in Hytanican society are more or less relegated to the “be seen and not heard” realm when it comes to matters of state or anything that would allow them to have an active, official role in government or society. Women bear heirs. Women manage households. Women plan social functions. Women look pretty. Woman are essentially second class citizens and Hytanican men are well within their rights to discipline the women of their houses as they see fit. Women do not become involved in the day-to-day running of a country, know the gritty details of what that requires and their opinion certainly isn’t sought after in such matters. In contrast, Cokyri is a female-dominated society , with men being the lesser party. Alera, while not entirely ready to throw off the weight of her society’s expectations, does begin to fight against them in small ways. She discovers that she has an “unnatural” interest in the goings-on of the Hytanican government as she learns more about Narian, Cokyri, the legacy that ties both countries together and what that means for their future. It’s a theme that I’m hoping Kluver addresses in the next two Legacy books, and I’ll be cheering Alera on, hoping she’ll break free of the constraints that would have her trapped in marriage to a man she doesn’t love. Love and duty, oh romance, we meet again. One of the reasons I’m drawn to love vs. duty romances is the absolute hopelessness of the situation the lovers find themselves in. Usually they can’t be together because it would mean catastrophe, or that they’d be rejecting people or ideals that they hold dear. I do adore a little heartbreak before my (hopefully) happily ever afters. It makes the ending, the victory, that much sweeter. Alera knows her father, knows he would never allow a marital alliance with Narian, a boy who grew up under the influence of the Cokyri. Yet, she finds herself unable to stay away from him; a genuine bond begins to grow between them even as she realizes that they will never be able to be together. It’s heartbreaking, it’s exhilarating, and it makes me hope beyond hope. As I stated before, this book isn’t necessarily a page-turner. So what did keep me turning the page when my interest began to wane? The romance between Narian & Alera. The only complaint I have regarding the love story is that huge chunks of their time together were missing. As a reader, I don’t want to be told that Alera & Narian talked for hours on end, I want to eavesdrop on the conversation. I want to know what they said, how they said it, what meaningful looks were exchanged, and what heartfelt secrets were shared. I got a little of that, but not as much as I would have liked while their romance was first developing. Overall, despite my complaints, I did enjoy Legacy. Kluver has created a sweeping, romantic, heart-rending fantasy that has me anticipating the next book to see what fate has in store for Alera, Narian and all of Hytanica. Check out the Summer Giveaway Hop! Many happy turns of the page! Thanks sharing your honest thoughts and opinions about the book. I look forward to reading this novel. Thank you and I hope you enjoy it! I’ve been eyeing Beautifully Broken and I’m hoping to get to it soon! It’s a very good read, and yes, the cover’s beautiful Thank you for stopping by Margaret! I have mixed feelings with Legacy as well. It’s really quite a read and you can either love it or not quite enjoy it. The way the Hytanican treat their women pisses me off, but at the same time makes me want to see through the story to see if there will be any changes since Alera seems to be not a typical Hytanican woman. I didn’t see this review when you 1st posted it. I agree with you about the amount of detail, though. I was a bit torn on this book, but I did like it. Glad to know I wasn’t the only one to feel conflicted, and I’m glad you enjoyed it as well!